Charming 3 bedroom cottage is move-in ready and has been completely restored inside and out. Fresh paint everywhere, all new carpet in bedrooms and engineered wood flooring in Living/Dining and kitchen. Updated bath and kitchen with Corian countertops and fresh built-in cabinetry. New 50 year metal roof with r-30 attic insulation. New 200amp electric service. New decking front and back. 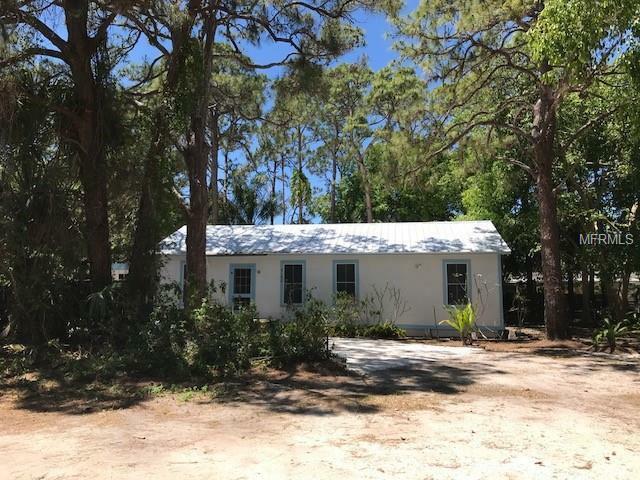 Every inch of this property is in like new condition, yet it has a history as a chapel in Boca Grande and was moved to it's present location in 1960. Two out buildings, one with washer/dryer and work shop, the other for storage. The property is located at the end of a private lane on a spacious lot with mature Florida pines and tropical plantings, and is conveniently close to shopping & restaurants, beaches & marinas.